I have loads to do today. I am miles behind with NaNoWriMo, I have to write a number of pitches and the house looks like a tip. ‘Oh darling’ I said to OH when I was made redundant ‘just think, if I go back to working from home I can do all the washing/ironing/cooking/cleaning…’ All my feminist instincts (and pathological laziness where housework is concerned) out of the window in order to pursue my freelance writing dreams. Now terracotta carpets are black with dog hair, the bath plughole is blocked with goodness knows what and there is nothing for dinner. And I can do nothing about it. 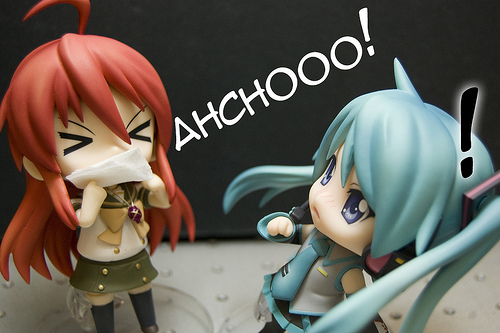 For the first time in years it seems, I have a cold. OK, so I am still going to go to lunch with a friend I haven’t seen for ages, and then take my Mum out for a coffee but apart from that…. My general malaise has been made more severe by a very odd night’s sleep. Can Lemsip give you hallucinations? Was that what inspired Coleridge to Kubla Khan rather than laudanum? or The Stranglers to ‘Golden Brown’ perhaps? In my most peculiar dreams I was prevented from having a shower because Neil Oliver from ‘Coast’ was decorating our whole house, and when I had at last got dressed in a fetching blue lycra number Louise and Jamie Rednapp turned up uninvited with a horrid little dog and won a Christmas hamper. What part of my subconscious does this stuff come from? Neil Oliver in my shower has a certain appeal – but lycra and Louise Redknapp? It was the stuff of horror movies. I woke up all hot and bothered and was frightened to set foot in the bathroom. But now, the way I feel this morning, I am inclined to empathise with the male point of view. I am not too ill to do anything at all. It isn’t flu, it is just a cold. But I would love someone to be bringing me cups of tea in bed, a little soup for lunch perhaps and a light supper. Or chocolate, fish and chips and a bottle of gin. So where I should be writing thousands of words of historical fiction, I am writing this blog post. Where I should be tidying up and changing all the bedsheets I am going to shout at my teenage son to get out of his pit and do the washing up. The dog will have to cross his legs or pee in the garden. I want a hot water bottle, a teddy bear and my Mummy with a Dispirin in orange squash, and I don’t care who knows it. This entry was posted in Random musings on family life, love the universe and everything and tagged Cold, Coleridge, dreams, lemsip, Louise Redknapp, Neil Oliver. Bookmark the permalink. 3 Responses to Do women get manflu? And on why Coleridge should have tried Lemsip.. Sorry to hear your feeling a bit down, there is something quite nasty going around and i had it a couple of weeks ago so i kinda know how you feel! I found that lemsip was okay, but it kept me awake at night (i think it has caffeine, which can cause bad dreams incidentally!). Hope you feel better soon! Good luck with the writing! Lol, hope you get better soon and good luck with the writing. I’m a novelist so I know it’s hard work.